I confess, I didn’t make it to midnight last night. I left the party at ten, got in bed and the last time I looked at the clock it was 11:45. It occurred to me to stay up for another 15 minutes, but I my eyelids vetoed that proposal. I’m not into making a big deal of New Year’s Day because I’m sure it will be a day like any other, and probably a year like any other. That’s neither pessimistic nor optimistic. Perhaps just a little blah and anticlimactic. 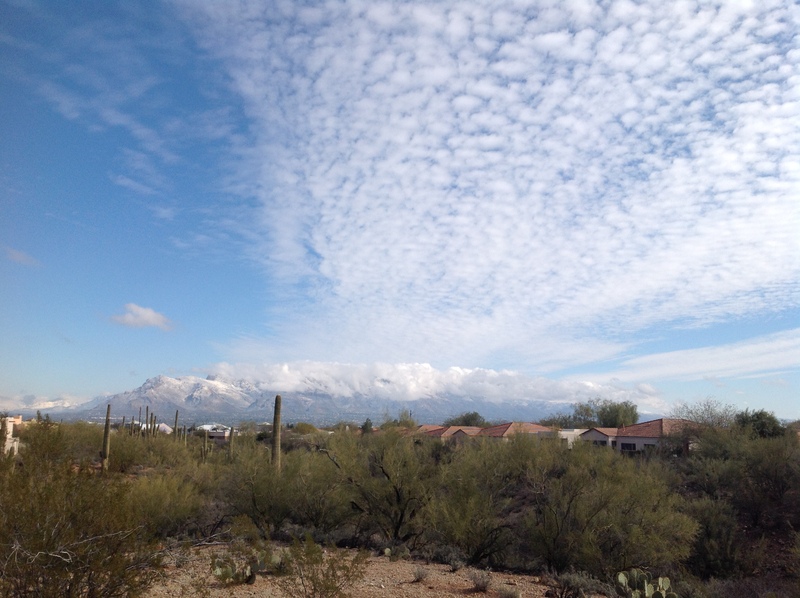 However, I woke up this morning to an unusual phenomenon: snow on the Catalina mountains. I gazed out my living room window at this extraordinary view, dreamily enjoyed it for a few seconds, then decided to step outside to take pictures. Just after I took my pictures my focus shifted to various quotidian worries such as the nipped bougainvillea, how the Saltillo tile needs re-coating already, how the telescope should not be outside but I wasn’t about to do anything to make that situation change, etc. Then I thought about posting my pictures on my blog. So quickly I’d lost sight of the very thing that brought me outside! Yet I was lucky enough to realize that I had given up an opportunity to see something differently. I noticed the radio tower off in the distance and remembered that just yesterday my husband spent a good hour driving around in the rain to chase down a mild curiosity that he’d had for the five years we’ve lived here. He drove to the base of that radio tower and noted the streets at which it was located: Zinnia and Kain. He mapped it. He oriented himself with our world. He came home so very pleased with himself and his fresh dot on our map. This is an activity that would never occur to me, but he does such things on a regular basis. He can busy himself with looking at maps for hours on end or watching weather on the internet. Of course, stargazing is one of his nightly rituals. Sitting around in a mall or even a Costco parking lot is a perfectly enjoyable activity for him. He’s an older fellow, so the pigeon-feeding cliché probably applies here. So we proceeded to spend fifteen minutes pinpointing a specific portion of cloud that we could both observe. He assured me that we’d pick a fast-disappearing cloud so I wouldn’t get too bored. Finally we found a portion of cloud to settle our sights on and we sat there watching it. And by God, it’s fascinating. It’s not a spectacular or momentous thing, but if you stare long enough, you get to feeling your eyes are playing tricks on you. You notice things you didn’t before, such as the way the mind freezes clouds into a kind of photograph, which ends up being a lie that you tell yourself to get on with life, otherwise you’ll end up becoming a philosopher like Thales and you’ll find yourself at the bottom of a well. Or in Cloud-Cuckoo Land. 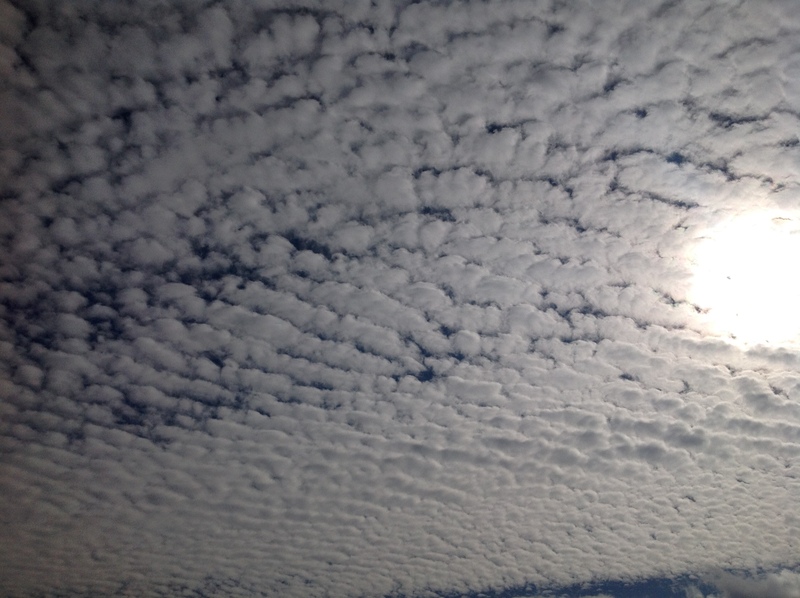 But when you pay attention, you see that these clouds are constantly disappearing, and not as slowly as you may think. And you can watch it happen. You can see it. I’d never seen it before. I’m not taking up meditation or yoga. I’m not a new person. Nothing has changed really. I didn’t really learn anything useful from viewing this phenomenon…I already knew that clouds disappeared. But sometimes we need to play, actually carry out our daydreams, follow through on whims. As a writer I should be naturally inclined to do such things, if only for the sake of describing things freshly, but I’m not. I don’t want to make this a New Year’s resolution—that seems a little too exacting for such a goal—but I hope in the future to allow myself more time and freedom to notice the world around me in a new way. Have you ever chased down a mild curiosity? Funny thing, I went for a walk earlier today, and when I got back to my place I just stood watching clouds for awhile before I went in. I also love (love, love!) maps. I have a collection I gathered over the years and have always thought about papering an entire wall with them someday. I love Google Earth and Google Maps! It’s fun to explore places you’ll never see that way. The map wallpaper idea sounds awesome. If you ever do complete such a project, I’d love to see pictures. My favorites are old maps, ancient ones. I think they’re beautiful. I have my walls plastered with maps of Athens and the Acropolis, but the wallpaper idea is even better. Oh, my, yes. Long ago map making was as much an art as a practical exercise! Some of those old maps are gorgeous! The whole problem with the wallpaper thing has been the idea of moving. My life hasn’t been terribly stable — I’m in my fifth place in 30 years. But I think this might be the last one, plus I have a high vaulted ceiling and a large blank wall below it. I hate it when I have to actually look at the manual! Men certainly do love their maps Tina; and I wonder if it’s something to do with their natural obsessiveness and inclination to control? Am I stereotyping dreadfully? Probably. Still, what you describe as regards the clouds indicates how we all depend on maps of one kind or another. Our minds create static conceptions of the external world; they are in effect maps of the terrain to help us navigate are they not? Painters learn how to overcome this process, painting what they see rather than what they might otherwise think they may see. Contemplatives come to do it too, as you indicate in your piece Tina. It is fascinating to first observe that the world as idea is quite different to that world as it is. I’ve noticed that men love their maps. I can’t get into it in quite the same way my husband does, but I can if I have some reason to be looking or something to compare the map to. Maps and manuals. You guys! Very true about painting. I was never able to see what’s really there as opposed to what I thought should be there, and so never became very good. I am very guilty of living comfortably in my static conception of the world. The auto-pilot needs those static conceptions; after all, they come in handy when you want to get on with other things. So, you paint too? Musician, artist, philosopher, writer, part-time map reader; I bet you’re no good at wasting time. I like auto-pilot mode. Thinking and seeing…very hard. I “paint”, I “play guitar” and “sing”…I hope someday to say I write without putting that in quotation marks. The rest can stay in quotation marks. Funny thing, lately I’ve had a bout of lightheadedness which makes it hard to concentrate on anything. Blogging is great for this…I can feel somewhat productive without having to focus really hard. But in all honesty, I’ve been wasting a LOT of time lately. Just not in the utterly unproductive way that I’m talking about in this post. I still haven’t learned how to do that. Productivity is vastly overrated in my opinion; and I suppose we’ll have to add ‘time-waster’ to your list of talents. That is something which people find increasingly hard to do intentionally. We’re all obsessed with acquisition and achievement; and there’s no time to waste. Good for you Tina; I’m pleased to be president of a club which counts you amongst its members. Looking at the word in a new way is always fun. You never know what you may come across. Great post! A nice little piece of writing, I enjoyed it. What the Japanese call Zuihitsu, following the brush, and somehow the topics emerge by themselves. This staying up beyond midnight on New Year’s Eve is one of those rituals one should consciously look at. New Year is a kind of fiction anyway. When you where fighting with sleep, here in Germany it was already over and when I celebrated with my older sister and friends here in Stuttgart, my other sister in New Zealand was already up again (I suppose). The counting of the years and the date we consider the end and start are artificial constructuions as well. These are games we are playing. There is no point in watching the clouds here at the moment, the sky is uniform grey. But I like looking at how clouds are developing. It is interesting that we do not really have words to describe these phenomena. It would be a lot of work to develop a vocabulary for them. So such phenomena throw us into a state before words. I love that. I have written about this topic in the article “Before Words” (thanks for liking it). I don’t know if it is true that man have better spatial orientation on average than women. It might be a myth. It might be cultural. But if there is such a difference it might have something to do with the hunting expeditions of our home erectus ancestors. I don’t think it has something to do with control. Finding my way and learning about the terrain, if in reality or on a map, is a kind of fun. I like to do it on foot or on bike. I hate going by car, however, because I have to spend too much mental energy then to concentrate on the traffic. I don’t like things with buttons so much. I am using a computer every day and I like to know what is where, but having to find out how something is done is a waste of time. I don’t own a smart phone. I have a very old fashioned mobile phone with no touch screen and no apps. A smart phone would take my time away and make my interface with reality more complicated. I like devices that are as simple as possible. As my greandfather, an engineer, used to say: a machine is finished when there is no part again that you can take away. Thanks so much! Yes, this is a different style of writing for me. Something along the creative nonfiction line, which I’m not too familiar with. I thought about taking a creative nonfiction class, but I’m afraid I’ll be stuck critiquing a bunch of memoirs. I’m not really interested in that. “Creative nonfiction” still sounds a bit like an oxymoron to me…I have the dry style of philosophy on the one hand, and on the other, fiction. These two are still very compartmentalized in my head. Merging them is challenging, especially since creativity can cloud up points. But this is the logical next step for my development as a writer. And the blog is a perfect place for it, it seems to me. As for staying up to midnight, you know, I had the same thought! At the party, I mentioned to someone I’d be leaving early and said, “Hey, it’s midnight somewhere.” (The phrase is meant to be used in regards to Happy Hour). On the spatial orientation thing, my husband and I are about equal. Often times on road trips he won’t know where we are, but I’ll figure out how to get around and boast, “How’s that for a female sense of direction?” 🙂 On the whole, I’m not sure there is a big difference between men and women, but I have no real basis for saying that other than my own experience. There’s the cliché about men being unwilling to ask for directions, but between me and my husband, he’s the one who always insists on asking for directions, and I’m the one who’s stubborn about figuring it out myself. This happens frequently in the grocery store when he wants me to ask an employee where something is. I’d rather just run up and down the aisle and holler behind my shoulder, “You think that guy looks like he knows? He doesn’t know. He doesn’t even know what phyllo pastry is.” 🙂 But at least I’ll admit I’m a jerk in this regard. If I lived in Europe, I’d go around by foot everywhere too. Here in Tucson, it’s pretty hard to do that because everything is so spread apart. There are people who ride their bikes all over town, but I would be afraid for my life. I got rid of my motor scooter because the drivers here are too insane. I’m still really sad about giving up my scooter. It was so much fun. I really enjoyed driving a Piaggio on a Greek island…I’ll never forget that. You get a great sense of the land that way, although it is dangerous. Scooting and walking would be my modes of getting around if I lived in the right place. Honestly though, I spend too much time at my gadgets. If it weren’t for my husband saying, “Tina, get out of your hole,” I might never leave set them down. I like your grandfather’s saying. There’s a lot of beauty and elegance to that approach. I can appreciate that. Perhaps someday I’ll feel the need to simplify, but right now I’m enjoying all my gadgets buzzing and ringing at me and each other all at once. I love the “creative nonfiction” stuff and I am sometimes trying to write things like that. It is not easy, but I think I am getting better bit by bit. I really wonder how women got along before the phone was invented. It can happen that I come home and I have no chance to say anything to my wife for two or three hours because she is talking on the phone. I think I am very insensitive to peer preasure. I just ignore it and people have given up on me, so I have a lot of freedom. Thanks so much! These are some of the wonderful things about marriage—we learn so much from each other, often in small ways that add up. And in the best of marriages we temper each other’s excesses so that each becomes more well-rounded and balanced, and happier in the long run. I know my husband does that for me, because I can be excessive in pretty much everything I do! I just hope I do something like that for him. I’m sure you do, since you have well ordered habits of thought. Yes, I think the best marriages involve this kind of complementarity. It is something I have been fortunate to experience! Great post! Glad to hear your hub is an astronomy-lover. I once made my own 8inch reflector telescope mounted on a car axle bearing-mount. I used it in an urban setting and could see nebulae and double stars. I also borrowed a refractor scope and sat for hours making drawings of sun spots. (which I’ve still got). Alas I no longer have the telescopes. That sounds amazing! I will tell my husband about this. He’d love doing a project like this…he likes building things and does a lot of woodworking, but this would combine his hobbies. How did you learn how to do it? Is there a website or something I can direct him to? Hi (Tina, is it?) I used a book from my local library. There are loads of ‘how to’ books about it and I used wood for the optical housing tube. You can buy ready-made mirrors from various astronomy outlets. Thanks for that. I can see him really getting into this. I’ll see if I can find a book. We have access to the University of Arizona library, so there will probably be something there. I think there are quite a few astronomy stores here too, so he’ll have people to talk to. And you should do it again! You could even blog about it and give us updates on your progress. Might want to wait until the warmer months, though. Men and maps…I used to pour over Atlases when I was a wee lad. It was a wander, wonder, and adventure thing for me. Social Studies in Spain also included memorizing every capital and country in the world, which directed me towards maps quite heavily. As a Classicist, maps are still part of my scholarly life. In reality, maps are just practical little buggers. On a side note, I saw “The Imitation Game” and “interstellar” yesterday, that was an amazingly philosophical experience. Loved both films, although interstellar was a bit lazy in regards to its philosophy. I wish my geography education were as rigorous! I haven’t seen Interstellar yet. I’ll probably hold off on that until it comes out on DVD. I’m glad you liked the Imitation Game! Two in one day, huh? Nothing quite like a movie marathon. Great post Tina. Reminded me a bit of a stop and smell the roses kind of theme which is very nice. Being out in nature has always provided the best kind of stress relief for me, so I can relate to the cloud watching thing. It’s strange. I like to take hikes, but whenever I do, I hardly “stop to smell the roses”…I usually just stay in my head. Nevertheless, it’s clarifying—a big stress relief for me too. Everyone loves maps it seems! All the time! Just last night we trekked out into the cold to see a comet. But it was cloudy, alas. Great post, from start to finish. Good for you! Too bad it was cloudy, though. And thanks! Interesting post. It is great when something seemingly ordinary, like looking at clouds disappearing, can change the way you look at the world. There is something revelatory about these type of experiences. I have had other similar experiences when I have been on my own walking through a forest or doing some hiking, or just wandering through a secluded place. I find something very soothing about simply walking while I let my thoughts wander rather than trying to think about something in particular. Thanks! I love to make references to Cloud-Cuckoo Land. Aristophanes rocks! It’s amazing how difficult it is to be okay with letting our minds wander. I chastise myself over it, but I’m learning it’s sometimes revelatory. Who knows where the next idea will come from? Don’t the best ones just fall from the sky when we least expect it?